Melbourne: Nathan Lyon has failed to take a wicket in Australia's ongoing one-day series against India but captain Aaron Finch is pleased with the off-spinner's role as they head into a series-decider against India in Melbourne on Friday. 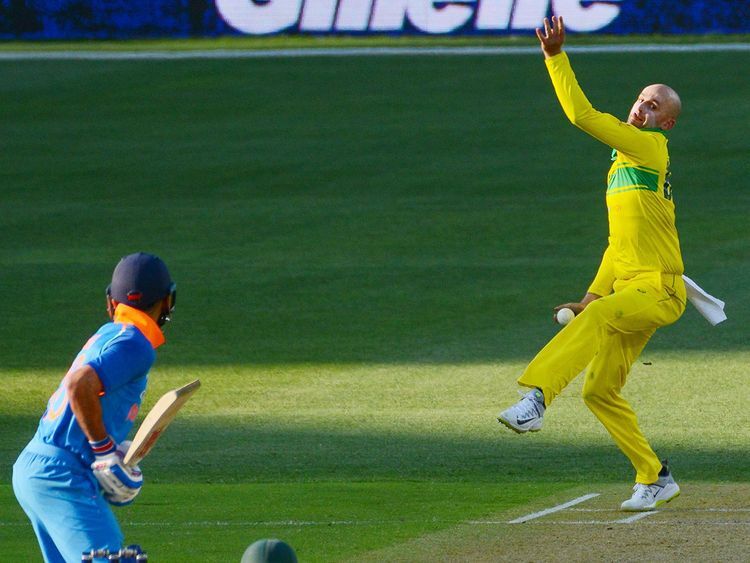 The series is locked at 1-1 after India won the second game in Adelaide by six wickets on Tuesday, following Australia's 34-run win in Sydney last Saturday. Lyon, 31, is Australia's undisputed first-choice test spinner, having played 84 matches and taken 339 wickets since his debut against Sri Lanka in 2011. However, he has struggled to have the same impact in limited overs cricket and played just 17 ODIs. Until playing two matches in England last year he had not featured in the one-day team for almost two years. Finch said he was pleased with the contributions from Lyon, who along with legpsinner Adam Zampa and left-arm spinner Ashton Agar are likely to vie for the slow bowling role at the World Cup later this year. "I thought the way Gaz (Lyon) has bowled has been really impressive," Finch told reporters in Melbourne on Thursday, adding that he was being asked to play a more containing role and was therefore bowling flatter and more defensively. While Lyon has conceded 5.45 runs per over from both games, he has bowled a significant number of dot balls in each match. In Sydney he bowled 35 dot balls, but was hit for four sixes. In Adelaide he bowled 26 dot balls, but conceded three sixes and a four. All of the sixes were hit off flighted deliveries when he was trying to attack more, and Finch said the quality of the Indian lineup was a major factor in that. "(He has) bowled really well quite defensively, which I think for his role was pretty important," Finch said. "Anytime the ball's been tossed up ... he's bowling against some pretty world-class (batsmen) ... some all-timers, really. "When he keeps bowling that well he will get rewarded eventually." Finch added that pace bowler Jason Behrendorff was under an injury cloud for the match due to a stiff back and a decision might not be made on the left-armer's availability until Friday. "He's been monitored. Just a bit of a sore back ... he's had some back issues in the past so I think it's about managing him through this series and further forward," Finch said. "We're going to have to have a chat to him about that and speak to the medicos."